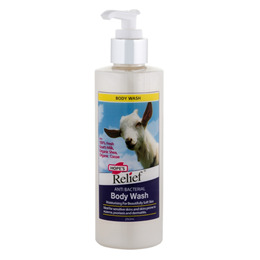 Hope`s Relief Goat`s Milk Moisturising Body Wash allows you to wash without irritating or stripping oils from your skin. Hope`s Relief only use 100% fresh goat`s milk as well as organic shea&cocoa butters which help soothe dry, itchy&sensitive skin. 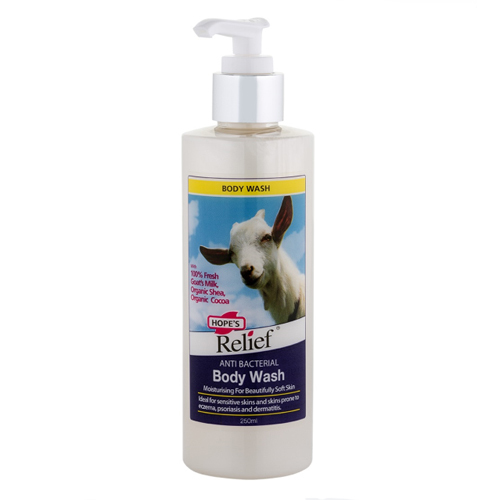 Unlike the Hope`s Relief Soap, many companies use powdered goat`s milk. The proteins in Goats Milk also make it an idea choice for teens or those with acne prone skin. The pH of Goat’s Milk is close to the skin`s own natural pH (5.5) and it is suitable for all ages from babies to adults. Aqua (Purified Water), Ammonium lauryl sulphate, Cocamidopropyl Betaine, Sodium Cocoamphoacetate, Caprae Lac ( Fresh Goats Milk), Avena Sativa (Oat extract), Glycerin, Glycol Distearate, Lactic Acid, Benzyl Alcohol, Butyrospermum Parkii (Organic Shea Butter), Theobroma Cacao (Organic cocoa butter), Pelargonium graveolens (Geranium) essential oil, Potassium Sorbate. Use the body wash daily and rinse well. Pat dry with a towel before moisturising. Below are reviews of Hope`s Relief Goat`s Milk Moisturising Body Wash - 250ml by bodykind customers. If you have tried this product we'd love to hear what you think so please leave a review. Everything that Hopes make is amazing. Creams that work, body wash that works. Superb product and a happy picture too making this a soothing product for mind as well as body. Great buy !